What are blocks from the past? Just an euphemism for UFOs – unfinished objects that have been long forgotten but have recently been put into a beautiful quilt. It’s also a reference to how my tastes in quilting have changed over the years. I have a number of UFOs that are based on more traditional blocks and traditional fabric that don’t appeal to me anymore. I’ve been taking them out and trying to finish them – sometimes as is but sometimes I try to change a few elements, add a wonky sashing or an off-grid layout. This quilt is one of them. I’ve been part of an online quilting forum – formerly part of GardenWeb, but now part of Houzz.com – for many years. The wonderful quilters in the forum are responsible for almost everything I know about quilting but they are also responsible of most of my UFOs :-). The participation has dwindled over the years but I always find inspiration, suggestions and fresh new ideas in the group. I won these blocks in a block lotto in 2009. Since then we went through a remodel and a move to a new home, and I had “lost” these blocks in the sewing room. The pattern is called hole in the barn door. The “hole” nicely frames various red floral prints. There were 20 blocks. I put them together 4×5 and added a border that echoes the “barn door” part of the block pattern. I did an overall flowery, swirly design for the center and a swirl chain along the borders. 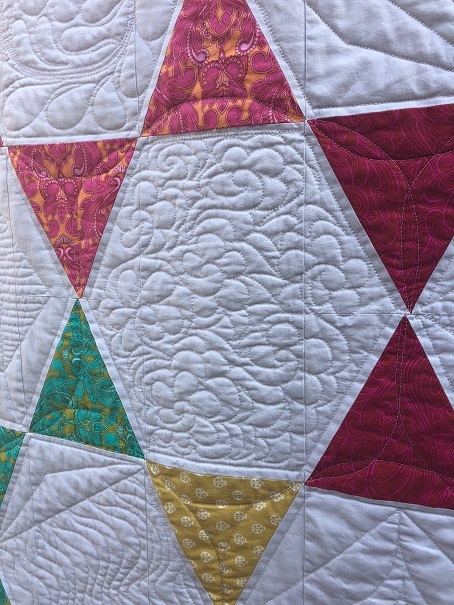 I wanted the quilting to blend into the center flower fabric – so I used a red thread for quilting. The quilt goes to my aunt, Kanaka. I was able to give it to her when I saw her last month on an unexpected trip to Chennai. My aunts were a big part of my childhood – each of them has influenced me and made me what I am today. Meet Rainbow Stars – made from a scrumptious fat quarter bundle of True Colors by Tula Pink. I was hoarding this bundle of fabric for many months, waiting for the the perfect pattern/idea to strike. This is also special because it is my first ever commissioned quilt. 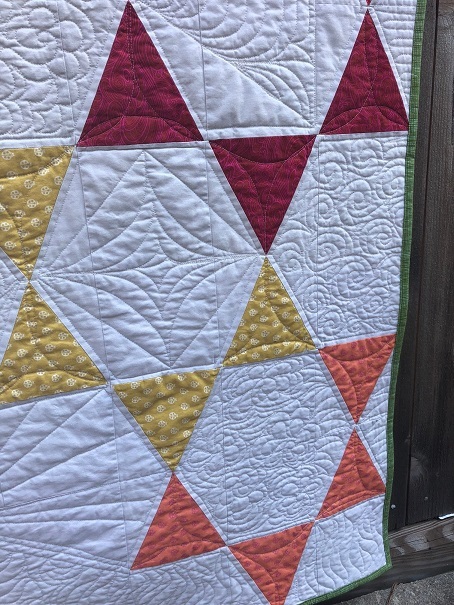 My college friend Rupa in Australia asked me to make a quilt for her friend. She looked over my quilts and a few on Pinterest and said she wanted something modern with bright colors. I had just got myself a Tri-recs ruler and put it to work. Tri-recs makes it super easy to make isosceles triangles that fit into squares. They almost look like equilateral triangles but they are not – the base angle is about 63.5 degrees. I simple laid them out to make interlocking stars, keeping like colors together. The top went together quite quickly. 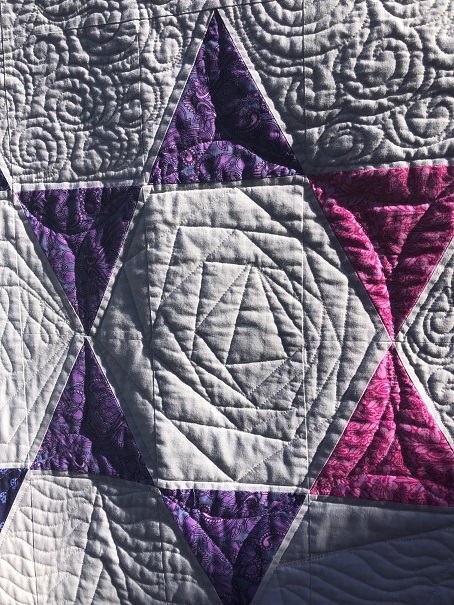 I quilted three curvy lines inside each triangle and an echo line around the triangles. This left a nice hexagon inside each triangle. I had fun coming up with a different design for each hexagon. I used some dot-to-dot designs to emphasize the hexagon in some or modify the hexagon in others. 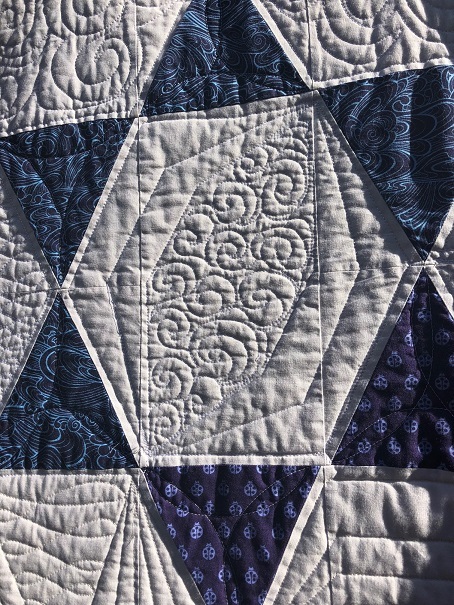 I quilted some swirls and feathers and paisleys in the negative space on top and bottom.